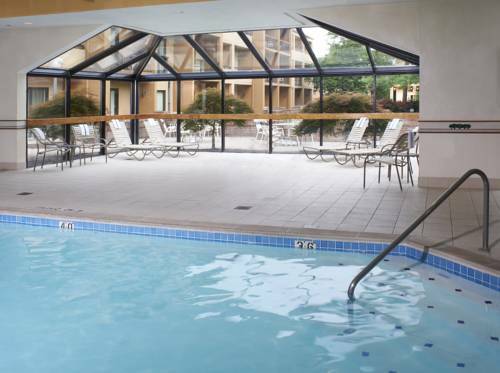 Retreat to relaxation at Courtyard Lexington North hotel. Located right off the I-75/I-64 corridor split, our hotel in Lexington offers easy convenience to all the Lexington area has to offer. Enjoy the races at the Kentucky Horse Park, Keeneland Racetrack, or Redmile Racetrack or attend an event at Rupp Arena downtown. The University of Kentucky and Lexington Bluegrass Airport are also within quick reach of our hotel. Following a fun-filled day, unwind in our spacious rooms and suites. We offer modern d cor, plush bedding and free Wi-Fi for your convenience. Enjoy a delicious meal at The Bistro; open for breakfast and dinner. During downtime, enjoy a workout at our fitness center or make a splash in our indoor pool. When it comes to your event needs, we have you covered. Take advantage of our two event spaces to host productive business meetings or small social gatherings. Whatever brings you to Kentucky, count on a memorable stay when you reserve accommodations at Courtyard Lexington North. Bistro Classics with a Twist: Your food and beverage destination for refreshing breakfast choices in the morning, and a variety of dinner, beer and wine options in the evening. The Bistro also offers specialty beverages made with Starbucks coffee to help you get a jump on the day.